Amor deliria nervosa, the disease that terrifies Americans. The disease that ravaged the masses, driving them to madness and death. Fortunately, there’s a cure. For 64 years now the public has been safe from irrational behavior, from pain, from fear–from love. But the cure is only effective for over-eighteens. And Lena is 93 days shy of her eighteenth birthday. I am not a fan of young adult romance. I’ve never had the personality, even as a teen, to appreciate mushy scenes, poetry under the stars and the I-can’t-live-without-yous, all of which Delirium has in abundance. More than any other genre, I find it difficult to suspend my disbelief and accept that life could really be like this, that there are really men (or women) out there as perfect as Alex. And I would hate for young readers to expect that love stays this fresh and exciting, because they are setting themselves up for a fall. Yet, I know there are many other women and girls who enjoy such an escape into the make-believe. 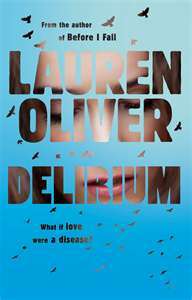 Delirium, I was pleasantly surprised, delivers much more than the typical relational fluff and happily-ever-after ending. In fact, it threw me for a few unexpected loops. I also appreciated the cunning of the state propaganda placed at the beginning of each chapter, quotes from fictional nursery rhymes, government pamphlets, or the all-encompassing Book of Shhh. In addition, Ms. Oliver builds solid characters behind Lena and Alex and places them in a tough situation: a country where love is forbidden and extreme measures are taken to prevent desire. Because desire is want, and want is not a sign of a healthy population. The mandated cure removes all desire–along with all passion and freedom, individuality and love. Quite convenient for the state, as those are all behavior that might lead to rebellion. But Alex, born in the Wilds, sees through their lies. Lena, in a tremendously difficult journey, comes to understand that the world she grew up is a facade. Nothing she has been taught is true. And when she catches the deliria, she will do anything to fight back. Delirium does contain some content issues that parents may want to be aware of. While Lena and Alex’s relationship remains fairly innocent, at one point Alex removes Lena’s shirt just to stare at her and tells her she’s beautiful. And religion gets a pretty severe twist. The government issues its own skewed brand of biblical history, including their own collection of Psalms and a fictionalized account of Mary Magdalene. Lying almost becomes a prerequisite for survival in this new America; the government lies to its people, Lena’s family lies to her, and Lena, when she starts to buck the system observes, “I lie so easily now.” Lena’s infatuation also becomes rather obsessive. She fears that without Alex she will “become ordinary again” and claims, “He is my world and my world is him and without him there is no world.” Elsewhere Lena concludes that “the only point” of life is to “find the things that matter, and hold on to them, and fight for them, and refuse to let them go.” And finally, the book includes a few dozen profanities. As far as Ms. Oliver’s writing is concerned, her book is well-fashioned, her story exciting, and her prose graceful. But I can’t say I’d recommend this one to my own daughter.